Reno, NV, Feb. 15, 2017– BRP (TSX:DOO) unveiled a new four-person flagship Maverick X3 MAX side-by-side vehicle tonight in Reno, Nevada, furthering its push to reshape the super sport market segment. The game-changing Maverick X3 MAX vehicle features the same sophisticated blend of defiant design, precision handling and exceptional power the two-seat Maverick X3 vehicle delivers, but also presents new levels of comfort and control to the multi-passenger segment of the off-road market. 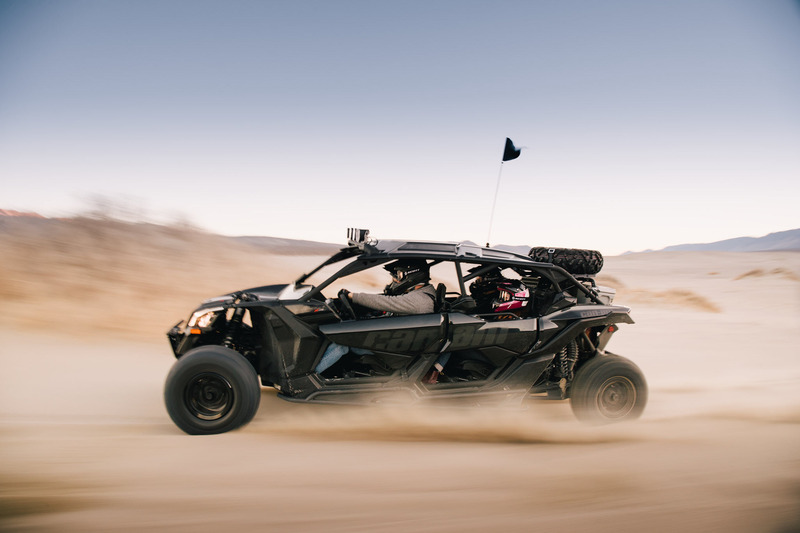 The two-seat Maverick X3 side-by-side vehicle has established itself as one of the off-road industry’s most appealing off-road vehicles from its initial launch. It has received high praise and elite recognition from the press, earned victories on the most famous race tracks and is more and more chosen by the off-road enthusiasts, further proving its performance and elevating the showroom experience for customers and dealers alike. The all-new Maverick X3 MAX side-by-side vehicle goes all-out in delivering its own blend of off-road dynamism for multiple passengers. The extremely bold Can-Am character and Maverick X3 family DNA is instantly enhanced with the expanded and spacious Ergo-Lok cockpit and longer chassis. All four seats in the Maverick X3 MAX vehicle are on the same level, giving every passenger a similar experience while seated low in the cockpit. All four Ergoprint seats are four-way adjustable to accommodate a wide variety of passengers, enhance comfort and better connect each occupant with the vehicle. The rear seats have 2” (5.1 cm) of height adjustment and up to 4” (10.2 cm) of forward adjustment. The rear passenger space also has up to 18% more seat pitch than the closest industry competitor for ample legroom. Full rear quarter doors and strategically placed passenger grab handles and footrests further enrich passenger ergonomics and comfort. The Can-Am Maverick X3 MAX vehicle leads its class with a high-performance, trophy-truck-inspired 4-link TTX rear suspension and recalibrated, premium FOX shocks supplying 22” (55.9 cm) of rear travel (Maverick X3 MAX X rs). Front arched A-arms provide up to 14” (35.6. cm) of ground clearance, while a full HMW (high-molecular weight) skid plate protects the underside of the vehicle. A high-rigidity chassis, made from fully welded DP980 steel, delivers precise handling, stiffer torsion and exceptional strength. The Maverick X3 MAX vehicle has a 135” (342.9 cm) wheelbase that is 15% longer (18”) than the closest competition for enhanced off-road confidence at higher speeds and additional room for both rear passengers. A quick-ratio steering system, next generation Tri-Mode Dynamic Power Steering, selectable driving modes and intelligent throttle control (iTC) contribute to the Maverick X3 MAX side-by-side vehicle’s and enhanced high-speed control. Maxxis Bighorn 2.0 tires, up to 30” (76.2 cm) in size, provide superior grip, while large 262mm front disc brakes provide ample stopping performance. The Can-Am Maverick X3 MAX side-by-side vehicle’s 154-HP turbocharged and intercooled inline triple-cylinder Rotax ACE engine offers immediate and impressive power delivery and an all-out adrenaline-filled performance experience. Three dedicated air intakes, placed high and dry, are combined with a premium, high-flow exhaust to create advanced airflow dynamics and a signature sound. An efficient, high-response QRS-X CVT transmission is calibrated to virtually eliminate turbo lag and enhance throttle response. Paired with the precision-engineered airflow system, the Maverick X3 MAX vehicle receives advanced cooling properties to maintain optimal performance levels at all times. The Can-Am Maverick X3 MAX family, includes three available packages: The Maverick X3 MAX and Maverick X3 MAX X ds vehicles are 64” (162.5 cm) wide, while the game-changing 72” (182.9 cm) wide Maverick X3 MAX X rs package presents two painted color options as well as 22” (55.9 cm) of class-leading suspension travel coupled with its fully adjustable FOX 3.0 Podium RC2 bypass shocks. 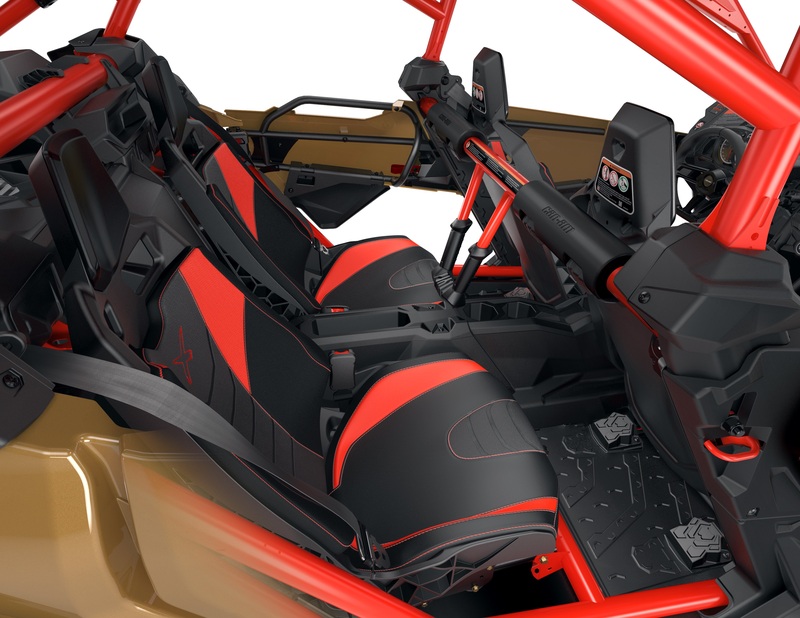 The Can-Am Maverick X3 MAX vehicle is designed in tandem with hundreds of genuine Can-Am accessories to deliver industry-leading fitment, improved convenience and enhanced performance. Exclusive accessory collaborations with established aftermarket companies have also been strategically developed to enrich the ownership experience by offering advanced customization options and new levels of comfort. The co-branded accessories were specifically developed for the Maverick X3 and Maverick X3 MAX lineups.